Fall style lovers, your patience has been rewarded. Layering season has officially arrived, and it’s time to add autumnal looks and multifunctional essentials into your closet. One piece worth investing in? A classic denim jacket. This versatile staple never drops off the trend radar. Whether you find yourself dolling up on the regular or just need easy basics for the weekend, this piece performs. It pairs as well with flares and ruffles as with slinky knits and casual kicks. In fact, there are few things a denim jacket doesn’t look good with. Still, we have a few guidelines for entering “perfect outfit” territory. Whichever end of the spectrum your personal style leans toward, we’ve got a look for you to try. Let’s review five on-trend ways to wear this forever favorite. A wide-leg pant and a boxy, cropped jacket are a win-win combo, especially with a hint of retro flair. When your pant leg is boasting volume, pair it with a fitted top to balance the silhouette. Layer on your denim jacket before you add playful accessories like a strappy heel and a bold clutch. 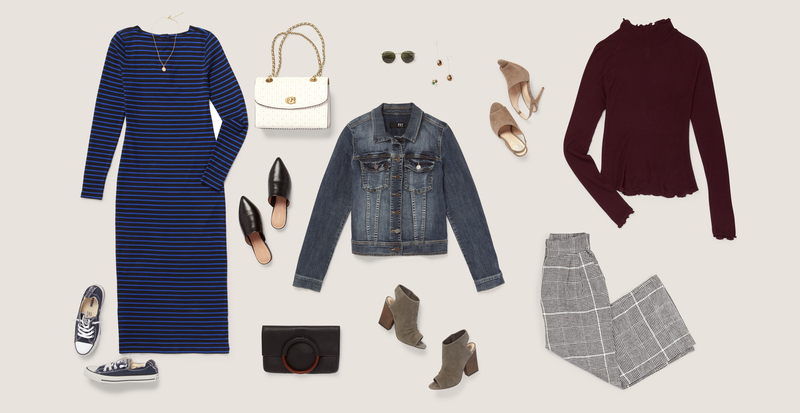 A knit midi-length dress is a summer-to-fall favorite. With a few add-on accents, it’ll become the perfect base for a laid-back look. Pairing a denim jacket with low-tops and a vegan leather backpack brings in a streetwear vibe, while giving you the freedom to do whatever it is you need to—whether that’s hanging out with your girlfriends or chasing after your kids. Denim naturally lends itself to the boho-chic aesthetic, so mixing it into a feminine, free-spirited look is a breeze. Try layering the jacket over a chiffon blouse with sweet details like ruffles and florals. A pleated skirt or wide-leg culottes like these will add movement and sophistication to balance out the structured denim. Distinctly pretty accessories wrap up this ladylike look. We say a denim jacket can be incredibly sleek and current—it’s all about what you pair it with, and black is a chic place to start. If your personal style is modern and minimalist, add a denim jacket over a black knit top, slip into black leather mules, and top it off with a statement bag. Balance the palette with suede or rust-hued bottoms. If black leggings are your Saturday go-to, try switching it up with a pair in luxe faux leather. (Equally comfortable, but with a bit more panache.) From there, a twist-knot sweater adds cozy fall style and slip-on sneakers keep things casual. Add an oversized leather hobo bag and you'll be ready for anything.